The second day of programming for the 50th Contemporary Music Festival at Indiana State University features guest ensemble Shattered Glass at 7:30 p.m. Wednesday, Oct. 26 in the University Hall theater. 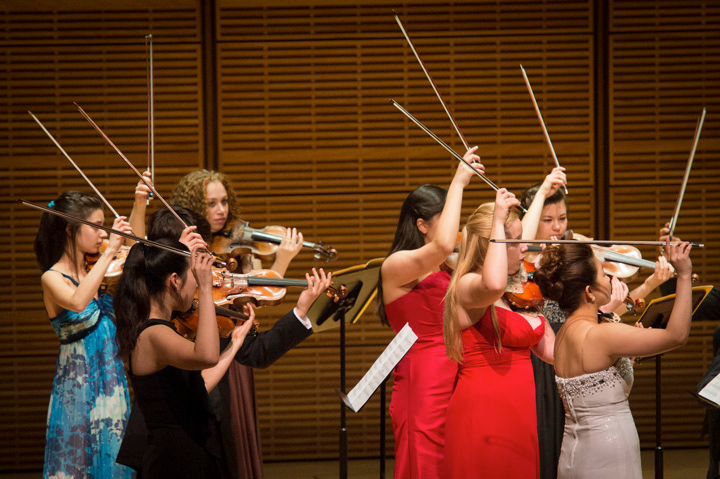 Shattered Glass is a conductor-less string ensemble that is truly collaborative and self-operated. Virtuosic and versatile, Shattered Glass has performed repertoire ranging from J.S. Bach to Krzysztof Penderecki and crossover projects with Grammy®-nominated hip-hop artists. Wednesday evening's performance features a piece written specifically for them by Pascal Le Boeuf, as well as works by Libby Larsen, Caroline Shaw and Krzysztof Penderecki. In its 50th year, the Contemporary Music Festival has brought internationally acclaimed composers, performers and speakers to Terre Haute. Members of surrounding communities, school children, university students and guests are encouraged to attend and participate in performances, educational activities and discussions focusing on trends in contemporary musical expression. Since its inception in 1967, the festival has developed a strong national reputation for the performance and creation of new music. Some of the most important composers of contemporary classical music have come to participate in the festival, including 18 Pulitzer Prize winners and five recipients of the Grawemeyer Award. For more information and complete schedule, go to indstate.edu/cas/cmf.